This Page will grow over time, containing more activities and ideas for scaling big things down, and little things up. If you have an idea, you can submit it to my email address here, or you can post on my Facebook page, or tweet me @djsmapping. And HERE is a review from a home-school mother. And Click Here for a lovely review from KidsReads.com, part of the Book Report Network, a review site for books for children. <--- Click cover image to the left to go to amazon.com to read reviews and to order. Don't want to order from Amazon? THIS LINK will take	you to IndieBound, to order from an independent	bookseller near	you. Here's a blurb From Publisher's Weekly -- See the first paragraph. This new book of mine is a "category killer", and "there's	really nothing else like it out	there, every page is a lesson plan". A librarian in Azle, TX, does a regular video called Book Hooks. Here's a link to one she made about "IF". David Smith has provided all kinds of school consulting, for more than 22 years. He does assemblies and classroom visits, and also provides in-service programs for teachers, and evening programs for parents and families. He also does a great many on-site or virtual author visits. "I love to do classroom visits, and I do them in-person, via Skype, via mail or text, and fees are low." For information about these services, please click here to contact David by email. 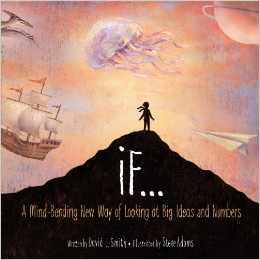 * A writer and reviewer in Australia has created a wonderful page about "If", with her review of it, and also a collection of very useful notes about how to use the book when reading it with children -- with 1 child, or with a classroom. Click here to read her review and teaching notes.